Hold the phone, CocoOJ2O has been dethroned. So apparently beet and tart cherry juices are the juices du jour for athletes, beet supposedly because it improves oxygen delivery to muscles and tart cherry because it aids in muscle recovery. I couldn't find beet juice at the Jewel, but I did find tart cherry juice and it's very good. So I'm trying tart cherry instead of orange juice in my workout drink, which I figure is pretty much the perfect delivery system. I think the tart cherry juice tastes better than the orange juice did, too. I mean I love you, orange juice. But diluted, not so much. And actually, tart cherry juice tastes better mixed than straight; diluting and also the sweetness of the coconut water smooths out the tartness. And also OJ2O tends to separate after a day, it's drink it or lose it. I partly judge my workouts by how much juice I have left, or if I drank all my juice and refilled with water, woo, anyway, my point is if I have a light workout, I can pop the leftover cherry juice back in the fridge. I figure I'll just eat my beets until I get up the escape velocity to get to Trader Joe's to try their beet and purple carrot juice. 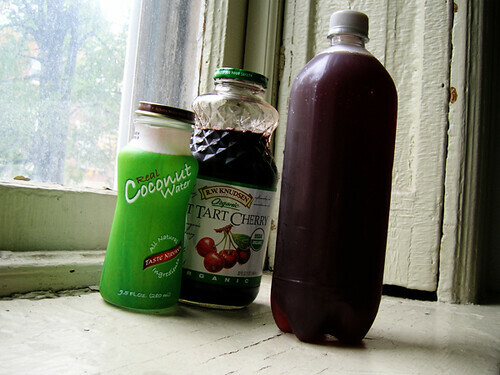 Just eyeball the measurements: fill a liter bottle with a bottle of coconut water, a few glugs of tart cherry juice, and then the rest water.